The Mighty Turbans are back by popular demand. Hear "Jingle Bells," "Deck the Halls" and "Hark! The Herald Angels Sing" performed with bongos, vibes, string bass, groovy Hammond organ and exotic native calls. 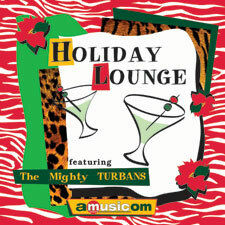 Celebrate the season with this cool collection of Lounge tailored exclusively for holiday hipsters, courtesy of Amusicom.